Folks, the season is upon us. From here on out it’s all eating and drinking and nibbling and grazing. Dig out your elastic waistband pants and find all those wine bottle sized gift bags you’ve been hoarding all year. It’s also time to think about some good recipes – things to serve, things to bring, things to gift. Holiday-ish recipes that are delicious and festive, impressive but not too complicated or time consuming. (Nothing will crush your holiday spirit more than holiday stress.) As much as I love a pinecone cheeseball, I needed some new ideas for festive appetizers that rang all those bells but let’s be real, are there any truly new appetizer ideas or has everything been done to death? I started googling and came upon several “lists” – compilations of the best holiday appetizers to make this season. Nothing really blew me over (how many version of meatballs can there be??) 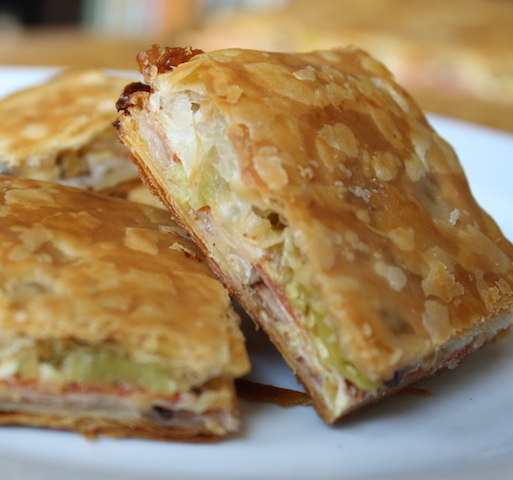 but one did intrigue me … Antipasto Squares. Now, antipasto things – that awesome mix of Italian meats and cheeses and vinegary dressings and/or pickled things – are easily one of my favorites whether they’re on an iceberg salad from an old school red sauce joint or piled into a crusty sub roll. This idea called to me; practically hit me over the head. 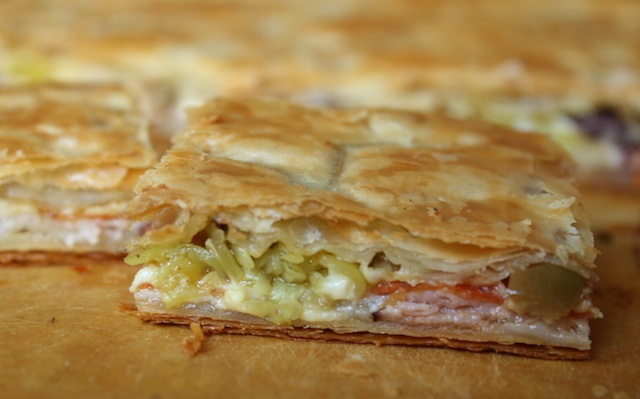 The recipe had all these delectable meats and cheeses and pickle-y things sandwiched between crescent roll dough, baked until golden and cut into squares. Yes, yes, yes and … NO. What? Crescent dough is all kinds of wrong. Too soft, too bready, too sweet. Too … pizza like. This would be so much better with something crispy and flaky. Like puff pastry. And let me just say this right now … I was 100% right. 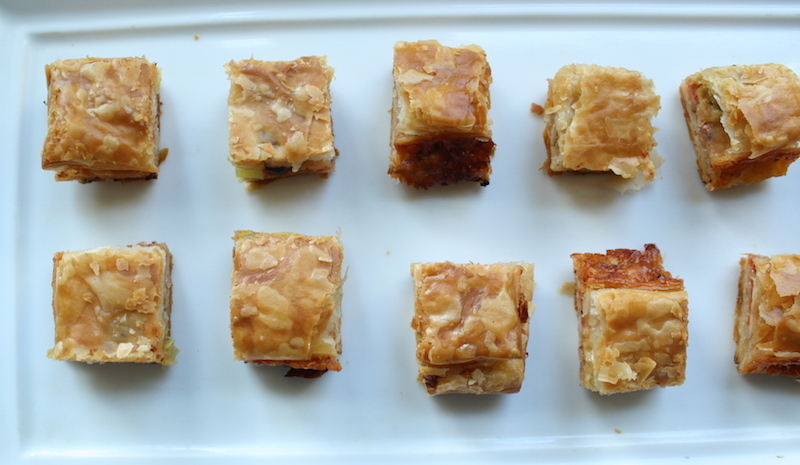 I quickly rolled out a sheet of all-butter puff pastry on parchment to even out any creases and slid it onto a rimmed sheet pan. Next, thin layers of ham, provolone, pepperoni and mozzarella; the good stuff from the deli counter in big, thin slices. Then a scattering sliced pepperocini peppers and chopped black and green olives added that necessary sharp, vinegary component. Finally, a sprinkle of grated parmesan, a bit of oregano and a cozy top blanket of puff pastry. Now, here’s what brings this all together. Top this pile of deliciousness with a piece of parchment and another sheet pan to weigh the thing down. This is important as I wanted the layers crispy rather than light and puffy and the weight of the pan is just enough to compress the meats-cheeses-pastry so they fuse together during baking. Trust me on this. You don’t want a cheesy-meaty light as air napoleon. You want a cheesy-meaty-all-in-one bite. This compression makes something good even better. Bake the whole thing until just golden, remove the top parchment and sheet pan and bake a few more minutes, uncovered, until deeply golden and crispy and cheese oozes out the sides and toasts up into in little browned lava-like bits. Oh man. The two crispy buttery layers encase a distinctly Italian bite. While you can’t readily identify the individual flavors, it comes together beautifully and is utterly delicious. You can cut baked sheet into 1 ½” squares for a nice hors d’oeuvre or even smaller one-biters for those fancy cocktail soirées you most certainly throw. Serve them hot or room temperature. Assemble ahead and bake just before serving or bake several hours ahead and serve at room temperature. It all works. It is perfect. Use an all butter puff pastry if possible. It makes a difference. Trader Joe’s carries an affordable all-butter puff pastry (2 sheets = $3) only during the holidays (i.e., right now) that is quite good. Stock up. DuFour is a brand you can find at Whole Foods that is excellent and the price certainly reflects that (2 sheets = $14). You can make your own puff pastry, if you’re motivated and so inclined (it’s not that hard, just takes a bit of time.) If you have to, Pepperidge Farm, easily found in every grocery store will work though it’s made with no butter, rather palm, soybean and hydrogenated cottonseed oils. Go with what works for you. Depending on the brand, the size of the pastry sheets may vary. The pepperocini and olive mix is important. You need that vinegar-y accent to cut through the richness of the other ingredients. I personally like the simplicity of a pepperocini/olive combo but my grocery store has an olive bar in the produce department that has a sort of pickley vegetable mix that would be nice – pepperocini, olives, carrots, cauliflower. Give it a chop so it distributes better. Giardinara, that wonderful Italian relish of pickled vegetables in vinegar or oil would be great too. Whichever you choose, blot the mixture well on paper towels to remove any excess moisture. After baking, you may have some crispy, cheesy ooze around the edges. Leave it or trim it off with a sharp knife if the look offends you or you want to save the crispy bits for yourself. The best way to cut this thing: start with a serrated knife to cut through the top layer of pastry in a gentle sawing motion, then finish the cut with a sharp chefs knife. Now go make this thing and enjoy. STRESS THERAPY BAKING FACTOR: EASY APPETIZERING. Please. You got enough on your hands. Why make it harder? Just make this. Make it for your own parties. Bring it to other parties. Set it out on a pretty platter and call it a day. I served this before dinner to a group of 6 friends and they polished it off in no time and asked for the recipe. Do it. See tips above and read through the recipe before starting. Feel free to use giardinara rather than the pepperoni/olive combination, and be sure to blot off excess liquid very well. Preheat oven to 350°F and line a sheet pan with parchment. In a small bowl, combine the parmesan, oregano and pepper; set aside. 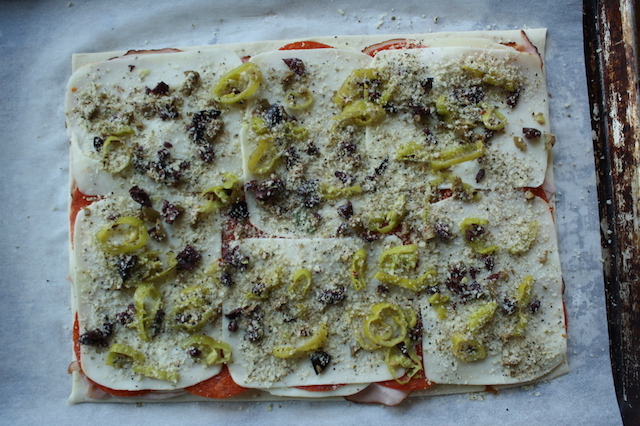 Blot the pepperocini and olives well with several paper towels to remove any excess moisture. Coarsely chop the olives and combine with the pepperocini. Set aside. Unfold a sheet of puff pastry onto a piece of parchment paper and gently roll out all the seams. Trim if needed to square off and even the edges. Slide the pastry and parchment onto a rimmed sheet pan. 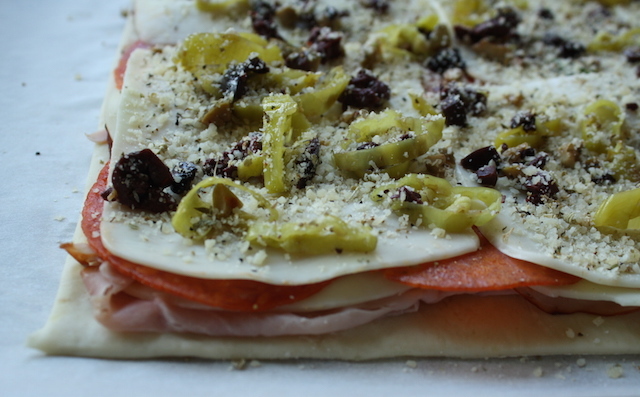 Layer with a single layer each of ham, provolone, pepperoni and mozzarella. Scatter the pepperoncini/olive mixture over the top. Unfold the second sheet of puff pastry onto another piece of parchment and gently roll out the crinkles. Trim if needed to square off and even the edges. Place the second sheet of pastry on top of the antipasto stack, top with the piece of parchment and weigh down with a second sheet pan. Bake until golden, about 25 minutes. Remove the top sheet pan and parchment and bake for an additional 5 minutes until golden brown. Remove from the oven and let cool 10 minutes. Slide the antipasto sheet onto a cutting board and slice into squares with a serrated knife. The best way to do this is to cut through the top layer of pastry with a serrated knife, then switch to a sharp chef knife to cut through the stack. Serve the squares warm or room temperature. Do ahead: it’s best to assemble the stack several hours ahead and store in the refrigerator tightly wrapped then bake closer to serving time but it can be baked several hours ahead and gently warmed in a 325°F oven. It’s also pretty good at room temperature.